We love race games, and car racing is among the most popular game themes. These are my picks for the best car racing-themed board games and card games. For 2 to 10 players, ages 10 and up. Designed by Laurent Lavaur and Eric Randall. Published by Asmodée Editions. Perhaps the most popular auto racing game available today, Formula D (formerly known as Formula De) uses a creative method of gear changing -- what gear you're in determines how big the die you roll is. Navigating turns can be tricky, and you need to watch your tires. With numerous tracks available (including some city courses and others based on actual tracks around the world), this is a must-have for fans of Formula One racing. For 1 to 4 players, ages 8 and up. Designed by Jean-Christophe Bouvier. Published by Rallyman. This is a clever race game which simulates rally racing, so every player is racing against the clock rather than head-to-head against each other. The unique dice, the modular game boards, and the forced decisions about risk-taking make Rallyman one of my favorites. 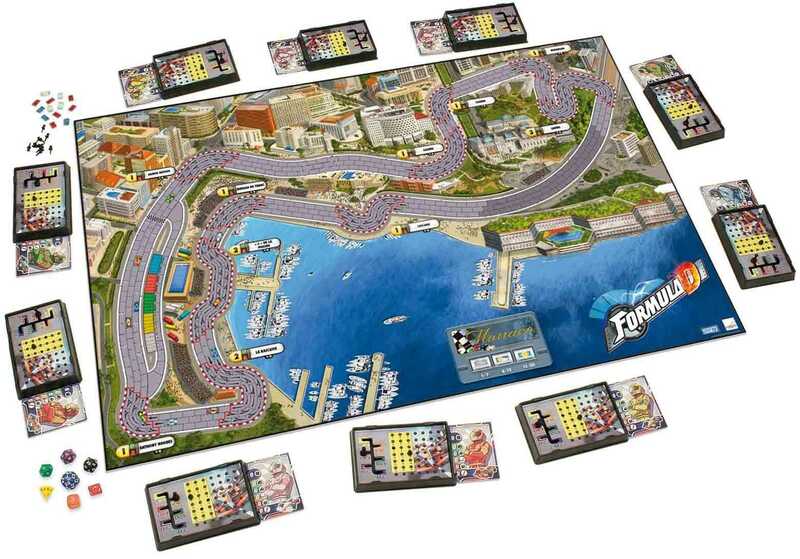 There are no dice in this Formula One-themed race game, as players use cards (each picturing one to six of the car colors) to move cars around the track. The game begins with players being dealt a hand of cards, then bidding to own the cars. To move cars, a card is played and each of the pictured cars are moved. The double-sided board features two race courses. Detroit-Cleveland Grand Prix is in the same family as Kramer's Daytona 500, Top Race, and Formel 1. For 2 to 8 players, ages 6 and up. Designed by Jean du Poel, published by Ferti. PitchCar is packed with finger-flicking fun. After assembling the wooden track (which can be put together in many different ways), players take turns flicking wooden discs around the track. If your disc flies off the track, you essentially lose your turn. The winner is the first to cross the finish line after a set number of laps. For 3 to 6 players, ages 8 and up. Designed by Reiner Knizia. Published by GMT Games. Formula Motor Racing is the most abstracted race game on this list. Each player receives two cars of the same color; their starting positions are randomly determined. All 12 cars are used in every race, and it is possible that a "neutral" car can win. Players receive five cards, and each turn consists of playing one and drawing one. The cards adjust the positions of the cars in various ways, sometimes using a 12-sided die to determine the precise effect. At the end of the race, the top six cars receive points. The player with the most points wins.